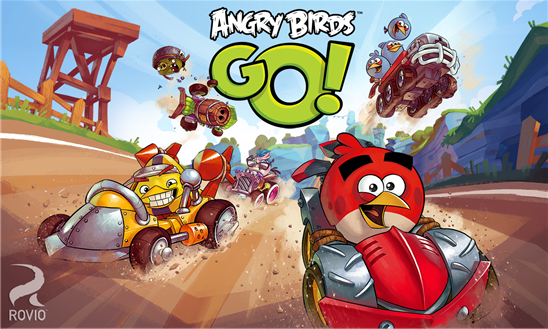 "Angry Birds Go" a brand new 3D Racing game with Angry Birds title by Rovio is now going to Windows Phone Store and available for free for Nokia Lumia with Windows Phone 8. Currently this game only availabe with Nokia Lumia Windows Phone 8 with minimum 1 GB of RAM. So sorry for Nokia Lumia 520,620,625 and 720.
" Welcome to downhill racing on Piggy Island! Feel the rush as you fling those freewheeling birds and piggies down the track at breakneck speed – with plenty of twists and turns in a thrilling race to the finish line! But beware! 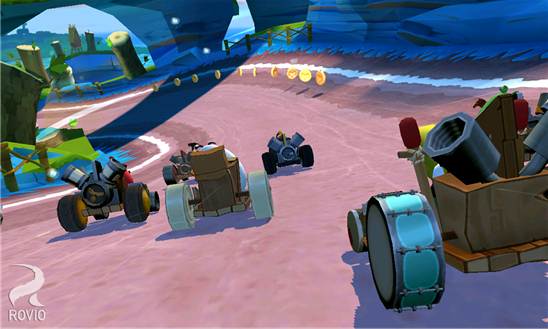 Look out for hazardous roads, mischievous opponents riding your tail and special powers to put the race leader behind the pack. Plus, go from soapbox car to supercar by upgrading your ride! Ready…Set…Angry Birds Go! "